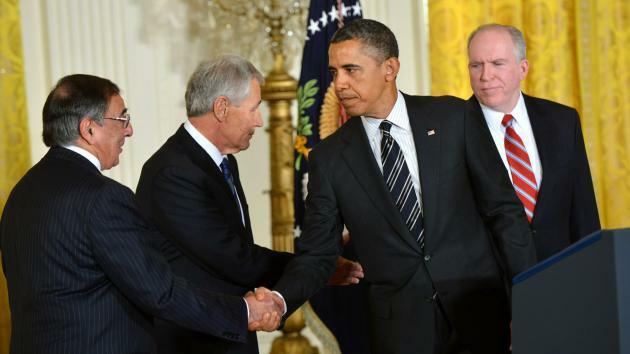 The GOP squandered two opportunities to ask proper questions of Kerry and Hagel. The Kerry confirmation hearing was a jovial affair for one of the first advocates on intervention in the Libyan civil war in 2011, which, by the way, received no congressional authorization. When Kerry was questioned about congressional authorization, he essentially bragged about his history of support for unilateral Executive action in Grenada, Panama, Kosovo, Bosnia, and yes, Libya. As USS Enterprise Retired, A Question: Why So Many Aircraft Carriers? NORFOLK, Va. (AP) - The world’s first nuclear-powered aircraft carrier was retired from active service on Saturday, temporarily reducing the number of carriers in the U.S. fleet to 10 until 2015. The USS Enterprise ended its notable 51-year career during a ceremony at its home port at Naval Station Norfolk, where thousands of former crew members, ship builders and their families lined a pier to bid farewell to one of the most decorated ships in the Navy. “It’ll be a special memory. The tour yesterday was a highlight of the last 20 years of my life. I’ve missed the Enterprise since every day I walked off of it,” said Kirk McDonnell, a former interior communications electrician aboard the ship from 1983 to 1987 who now lives in Highmore, S.D. The Enterprise was the largest ship in the world at the time it was built, earning the nickname “Big E.” It didn’t have to carry conventional fuel tanks for propulsion, allowing it to carry twice as much aircraft fuel and ordnance than conventional carriers at the time. Using nuclear reactors also allowed the ship to set speed records and stay out to sea during a deployment without ever having to refuel, one of the times ships are most vulnerable to attack. Romney Shined — Will it Last? I’ve shocked myself by feeling this way, but Mitt Romney has finally impressed me. As a Massachusetts native (and adopted Texan, thank God) I’ve been waiting a long time for my former Governor to fire me up. And I’ll admit – his debate performance Wednesday night actually got me excited. Romney looked presidential. Obama looked weak. Romney sounded authoritative, utilizing real facts, figures, and studies. Obama wavered and told irrelevant sob stories as a means to distract from reality. Anyone who watched could tell objectively, that Romney absolutely destroyed Obama. After all, the CNN poll wherein only 25% of viewers voted Obama the winner says it all. While I was highly encouraged by Romney’s performance when it came to domestic and economic issues, I’m skeptical that this honeymoon will last. I say this due to the fact that there is an upcoming foreign policy debate – and the way Romney has framed many aspects of this issue (particularly during his Republican National Convention speech) has made me cringe. Romney has unfortunately, made a habit of engaging in what Congressman Mick Mulvaney (R-SC) has brilliantly termed Military Keynesianism. In his column on December 30, George Will seemed positively giddy that 2011 ushered in a new era of fossil fuel abundance. You see, according to Will, this newfound energy abundance is good news for conservatives (and, presumably, libertarians) because the absence of energy scarcity is bad news for progressives. They need scarcity, Will writes, to justify “rationing … that produces ever-more-minute government supervision of Americans’ behavior.” And with this newfound energy abundance, progressives will have less justification for many of their big government endeavors. There may be valid reasons for conservatives and libertarians to take a skeptical approach to anthropogenic climate change. There are certainly good reasons for those who care about limited government to oppose the means that have been proposed to deal with it, which include such big government gems as carbon taxation and its initially conservative alternative, cap and trade. And you’ll be hard-pressed to find a conservative or libertarian who doesn’t oppose the scandal (Solyndra), overregulation (good golly), or nannyism (We <3 Incandescent Light Bulbs) that have passed for energy and environmental policy in Washington. But there are no good reasons for either conservatives or libertarians to be excited about fossil fuels. George Will argues that our newfound energy abundance will liberate us from many big government endeavors. I argue that our dependence on Old Energy empowers progressives — and, in some cases, conservatives — in at least five ways to insist upon the necessity of big government. Via the Daily Caller’s video producer Sean W. Malone comes this new mini-documentary reflecting on the horrors of 9/11, and an examination of how America and the world reacted in terms of public policy. The video features Daily Caller editor-in-chief Tucker Carlson, Cato Institute vice president for defense and foreign policy studies Christopher A. Preble, Cato research fellow in defense and homeland security studies Benjamin H. Friedman, Heritage Foundation’s director of the Douglas and Sarah Allison Center for Foreign Policy Studies James Carafano, Rep. Allen West (R-Fla. 22nd), and Antiwar.com’s development director Angela Keaton. National security policy, like all other forms of public policy, involves an innumerable series of trade-offs. We should be applying the same rigorous cost-benefit analyses to the Pentagon and DHS budgets that we do to social welfare programs. Iran’s President, Mahmoud Ahmadinejad made a speech last Friday at the UN which caused US “diplomats” to pack up their toys and run home. In his speech to the annual General Assembly, Ahmadinejad said it was mostly U.S. government officials who believed a terrorist group was behind the suicide hijacking attacks that brought down New York’s World Trade Center and hit the Pentagon. Another theory, he said, was “that some segments within the U.S. government orchestrated the attack to reverse the declining American economy, and its grips on the Middle East, in order to save the Zionist regime” — his way of characterizing Israel. “The majority of the American people as well as most nations and politicians around the world agree with this view,” Ahmadinejad told the 192-nation assembly. Shortly after walking out of the speech like spoiled little children, the US envoy responded by written statement claiming Iran’s president had offered up “vile conspiracies” and “anti-Semitism”. Even if you accept that the translation of his statements are perfectly correct, it isn’t clear at all that he claimed to believe the conspiracy himself, merely that a large number of people outside US government circles believed them. If there was ever a defining moment in the 2010 midterm elections, I would have to argue that it occurred when the statement above was made by a black construction worker who had just passed through a gauntlet of “protesters”. The crowd had assembled in lower Manhattan to express their absolute hatred for Muslims, fueled by years of neoconservative propaganda (though it only seems like a few weeks). The unidentified man, wearing a skin cap, immediately assumed to be a Muslim artifact, made the completely appropriate statement, under the circumstances, when the crowd started directing their vitriol toward him. Clearly, none of the protesters were interested in knowing his opinion but rather projecting it upon him. Yet, he probably made the most sensible and astute comment they had heard since tuning off Fox News before traveling to New York.